Chelsea blew open the race for the Premier League title by ending leaders Liverpool's 11-game winning streak with a deserved victory at Anfield. Demba Ba gave the Blues the lead at the end of the first half after Steven Gerrard's slip and Willian capped the win with a breakaway goal in stoppage time. The result ends Liverpool's 16-match unbeaten streak that had seen them march to the top of the table and means the title is no longer in their control. Manchester City can draw level with them if they win their game in hand, while Chelsea are two points behind, within touching distance should Brendan Rodgers' side slip up again. Blues boss Jose Mourinho had threatened to field a weakened team at Anfield ahead of his side's Champions League semi-final second leg with Atletico Madrid on Wednesday but, helped by a disjointed Liverpool display, he produced another tactical masterclass to earn the points. Liverpool's attempt at a trademark fast start failed in the face of a wall of blue shirts, with the visitors' five-man midfield sitting deep to protect their back four. Chelsea were keen to disrupt the home side's flow in other ways too, taking their time over set-pieces from the first minute onwards to visibly frustrate Liverpool's players as well as annoying their fans. Steven Gerrard's slip meant Liverpool trailed at the break and they have now won only two of their last 31 Premier League games when they have been trailing at the interval. The game's pattern of play was soon established. The Reds were still dominant in terms of possession but, on reaching the edge of the Chelsea area, they struggled to open up a typically well-organised defence. After Liverpool wasted a rare sight of goal when Mamadou Sakho blasted over, they failed to bring a meaningful save from Mark Schwarzer in the first half. Aside from a skidding Ashley Cole shot and an appeal for a penalty when Mohamed Salah's shot hit Jon Flanagan's hand inside the area, Chelsea did not threaten much either. But, with Branislav Ivanovic solid alongside rookie Czech defender Tomas Kalas at the back, their game-plan of frustrating their hosts was working and received an unexpected bonus before the break. Gerrard miscontrolled a Sakho pass then slipped inside his own half, allowing Ba to run unopposed towards the Kop before coolly slotting the ball past Simon Mignolet. The Liverpool fans chanted Gerrard's name at half-time but, try as he might with a succession of long-range shots, their usually inspirational skipper could not make amends for his mistake. An absorbing second half again saw Liverpool's attack up against Chelsea's defence and, again it was the stubbornness of Mourinho's men that prevailed. Even the introduction of Daniel Sturridge to join Luis Suarez in attack made little difference, with their usually prolific partnership failing to find a way through. Liverpool's best effort was a volley from Joe Allen from the edge of the area that a diving Schwarzer brilliantly palmed away, but in truth Schwarzer had little else to do until he acrobatically denied Suarez in stoppage time. Moments later, Chelsea made sure of the three points that puts the title race back in the balance. Fernando Torres broke clear and unselfishly played in Willian to fire home their second goal and ensure it was Mourinho, and not Rodgers, celebrating at the final whistle. Check out the best Premier League photos on the BBC Sport Facebook page. 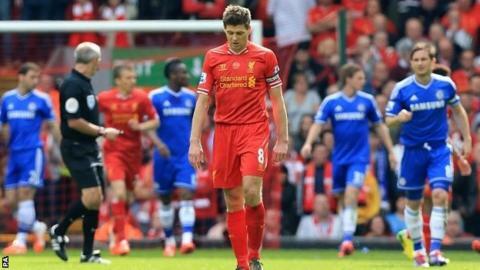 Match ends, Liverpool 0, Chelsea 2. Second Half ends, Liverpool 0, Chelsea 2. Goal! Liverpool 0, Chelsea 2. Willian (Chelsea) right footed shot from very close range to the centre of the goal. Assisted by Fernando Torres following a fast break. Fernando Torres (Chelsea) is shown the yellow card for a bad foul. Ashley Cole (Chelsea) is shown the yellow card. Corner, Liverpool. Conceded by Mark Schwarzer. Attempt saved. Luis Suarez (Liverpool) right footed shot from the centre of the box is saved in the top centre of the goal. Attempt missed. Steven Gerrard (Liverpool) right footed shot from outside the box misses to the left. Assisted by Raheem Sterling. Substitution, Chelsea. Fernando Torres replaces Demba Ba. Corner, Liverpool. Conceded by John Obi Mikel. Attempt missed. Philippe Coutinho (Liverpool) right footed shot from outside the box misses to the right following a corner. Corner, Liverpool. Conceded by Gary Cahill. Substitution, Liverpool. Iago Aspas replaces Jon Flanagan. Attempt saved. Steven Gerrard (Liverpool) header from the centre of the box is saved in the centre of the goal. Assisted by Luis Suarez. Substitution, Chelsea. Gary Cahill replaces André Schürrle. Attempt missed. Steven Gerrard (Liverpool) right footed shot from outside the box misses to the right. Assisted by Raheem Sterling. Delay in match André Schürrle (Chelsea) because of an injury. Attempt saved. Steven Gerrard (Liverpool) right footed shot from outside the box is saved in the top centre of the goal. Assisted by Philippe Coutinho. Attempt blocked. Glen Johnson (Liverpool) right footed shot from outside the box is blocked. Corner, Liverpool. Conceded by Tomas Kalas. Attempt blocked. Luis Suarez (Liverpool) right footed shot from outside the box is blocked. Assisted by Philippe Coutinho. Attempt blocked. Philippe Coutinho (Liverpool) right footed shot from outside the box is blocked. Assisted by Steven Gerrard. Attempt missed. Nemanja Matic (Chelsea) left footed shot from the left side of the box misses to the left. Assisted by John Obi Mikel. André Schürrle (Chelsea) wins a free kick on the left wing. Attempt saved. Steven Gerrard (Liverpool) right footed shot from outside the box is saved in the bottom right corner. Assisted by Glen Johnson. Attempt saved. Joe Allen (Liverpool) right footed shot from outside the box is saved in the bottom left corner. Assisted by Daniel Sturridge. Attempt blocked. Demba Ba (Chelsea) right footed shot from the left side of the box is blocked. Assisted by Willian. Attempt saved. André Schürrle (Chelsea) right footed shot from outside the box is saved in the bottom right corner. Assisted by Ashley Cole with a headed pass. Attempt missed. Philippe Coutinho (Liverpool) right footed shot from outside the box misses to the left.